We would like to wish a very Happy Thanksgiving to our readers. With the midterms in the rearview mirror, there’s still considerable debate over just how good a night November 6, 2018 was for the Democrats. To be sure, it was a great night for them in the U.S. House, where they took over the majority. And it has become a better and better night in the time since, as late-counted votes have flipped further seats in their direction. Their overall net gain will likely be nearly 40 seats. Then again, the half-full glass is also half-empty. It appears that Republicans will end up with about 202 House seats and a clear path back to (or at least near to) a majority if 2020 proves to be a good year for them. Their state legislative dominance remains largely intact, and having survived a mini political hurricane it is a durable structural advantage they will carry over to the next cycle and, in many states, likely into the next decade. Republicans stand an excellent chance of retaining at least a seat at the table in most states’ redistricting process after the next election. And the resolution of the key governor and Senate races in Florida and Georgia in the Republicans’ favor has certainly taken the sting out of most Republican losses. Then again, not everything is roses for the GOP. They can count their lucky stars that Democrats overreached in the Brett Kavanaugh nomination and got the conservative base as interested in voting as the liberals were already. But the GOP of the Trump era is proving to be unattractive to a very important kind of voter. One supposition was that the voter alienated by Trump would be the Hispanic voter — that Trump’s immigration rhetoric would cause his party a big problem there. But that didn’t happen, the exit polls strongly hint. 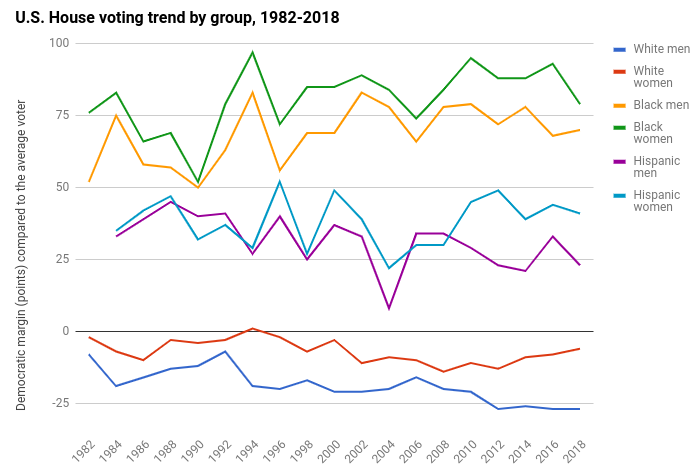 Before we go on, note that the charts below, created for this newsletter, show how each group has voted in House elections since 1982 compared to the average voter in each election. This is intended to control for the fact that electorates sway between the parties in any given year. 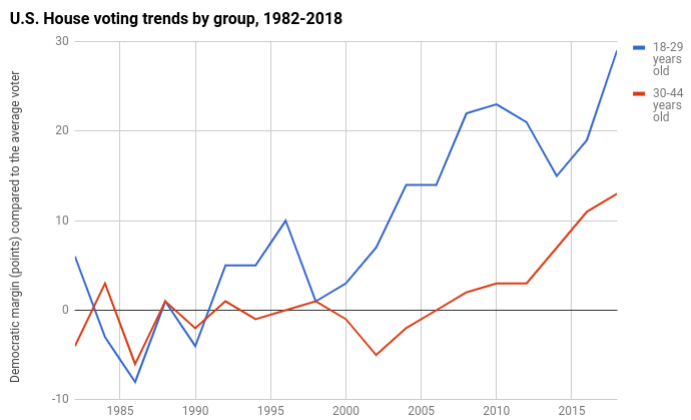 All other things being equal, these charts help show which groups are trending in one direction or the other over the long haul, without being fooled by temporary sways of the general electoral current in favor of one party or the other. Note that white women continued their own slight trend toward Democrats, which began after the 2012 election. White men, on the other hand, are as solidly Republican as they’ve ever been. In terms of religion, Republicans and Democrats split the Catholic vote, which nonetheless keeps coming in as more Republican than the national average. But Republicans have one very big problem that shows no signs of letting up. 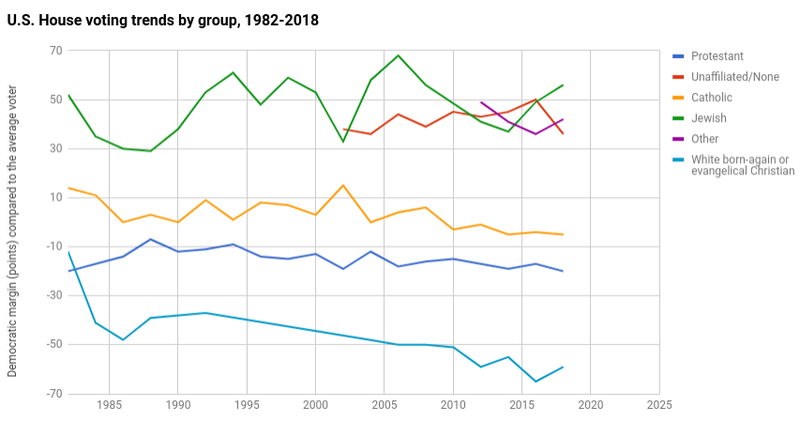 Whereas they can probably improve among white women and among Hispanics, the youth vote is trending sharply Democratic, and the trend only keeps getting worse for the GOP:Note that the younger, more left-wing vote is making its way into the next age bracket. 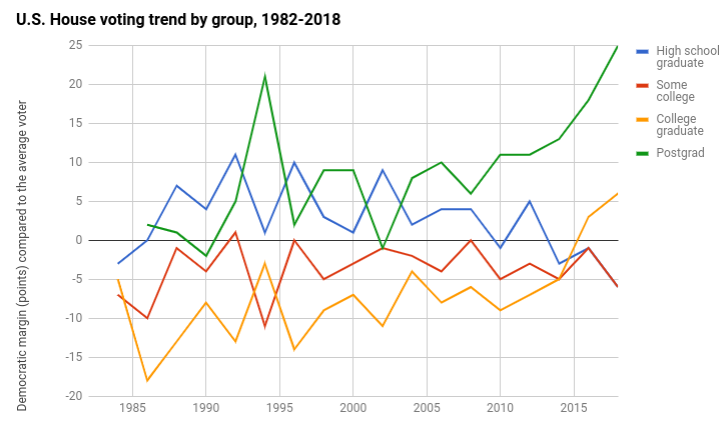 The 18-year-old voters of 2000 are now 36-year-old voters in 2018, and they are trending more strongly Democratic today than they were then. And as for the youngest voters today, they are more Democratic still. Yes, today’s younger generation of voters is smaller than today’s older generation, it is true. And perhaps it will also prove true that more conservative youngsters wait until later in life to start voting. But Republicans simply cannot survive long-term while doing this poorly among younger voters. This is a serious problem. 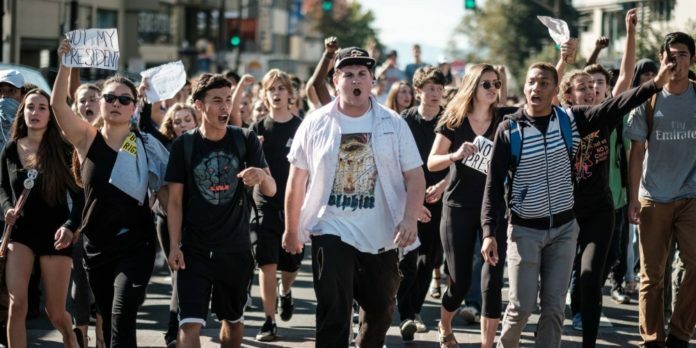 They have to come up with some way of spreading the conservative gospel to the young, because so far they are failing badly and sacrificing the under-45 vote to the Democrats in numbers that are unsustainable for a competitive political party. Mississippi: Now that Sen. Bill Nelson, D, has conceded his Senate race against Rick Scott, the only remaining Senate race for this cycle is the Nov. 27 runoff between Democrat Mike Espy and Republican Cindy Hyde-Smith. This race should be a shoo-in for Republicans, and it probably will be. But Republicans cannot afford complacency as Democrats and the media are working to make some relatively innocuous comments by Hyde-Smith seem malevolent. Hyde-Smith’s incompetence is evident, and once again the national party is being forced to bail out a Southern incumbent senator who should win by double digits. Roy Moore’s loss of an easy Senate runoff in neighboring Alabama has taught Republicans that they cannot sleep on races like this one. Trump will be holding two rallies in Mississippi on the day before the election, in Tupelo and Biloxi. Much like the other races in which Trump intervened, this one is tailor-made for him, and his presence in Mississippi should be helpful to Hyde-Smith. Election 2020, the electoral map, and how President Trump gets re-elected.